The Ohmer (fare) meter was made by Rockwell. 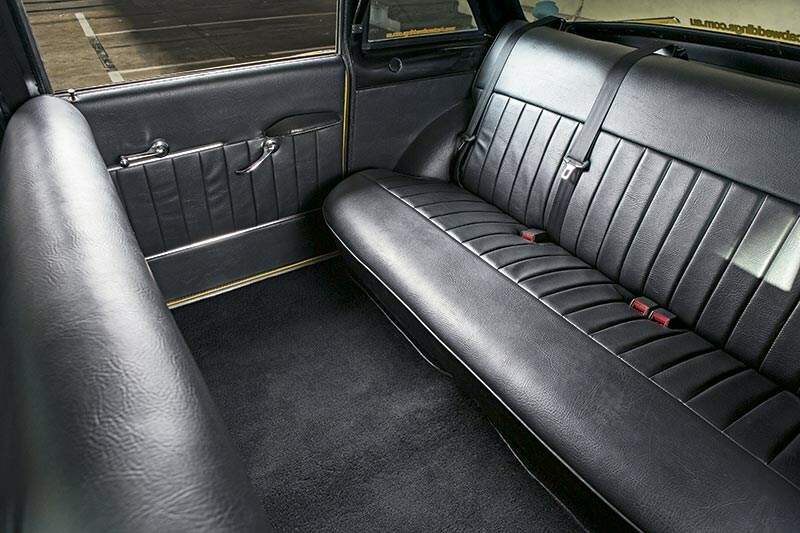 The Checker rear compartment could easily seat five. 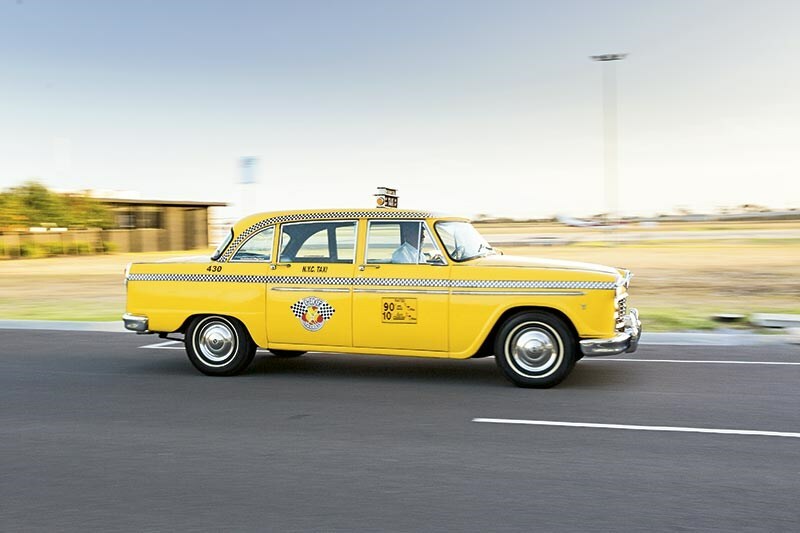 With as many stories to tell as there are miles on their clocks, John Bell's Checker cab fleet now calls Australia home. 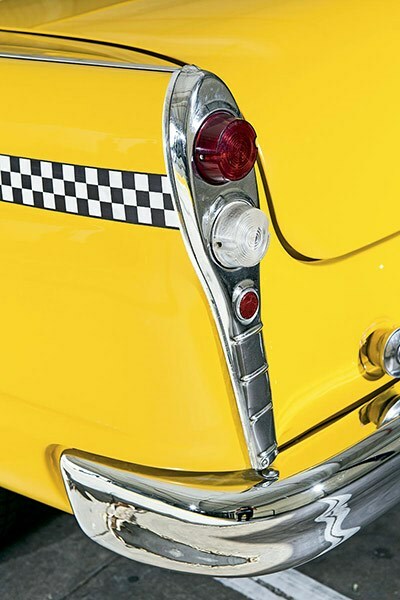 The New York taxi always was the grease in the wheels of the five boroughs. Airports, hotels, restaurants, sports stadiums, schools, homes and offices in and around New York were, for the best part of half a century, the daily beat of this gritty stroke of automotive design and engineering. But the footprint the Checker Motor Company’s A12 model left behind is even bigger still. These rugged, spacious sedans weren’t merely an NYC thing, making their mark right across the States, in cities like Chicago, Boston, and Los Angeles, a restless workhorse carting the huddled masses wherever they needed to go. 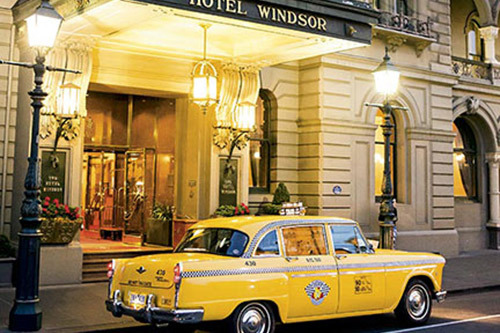 But New York’s big yellow taxi will forever remain an icon. 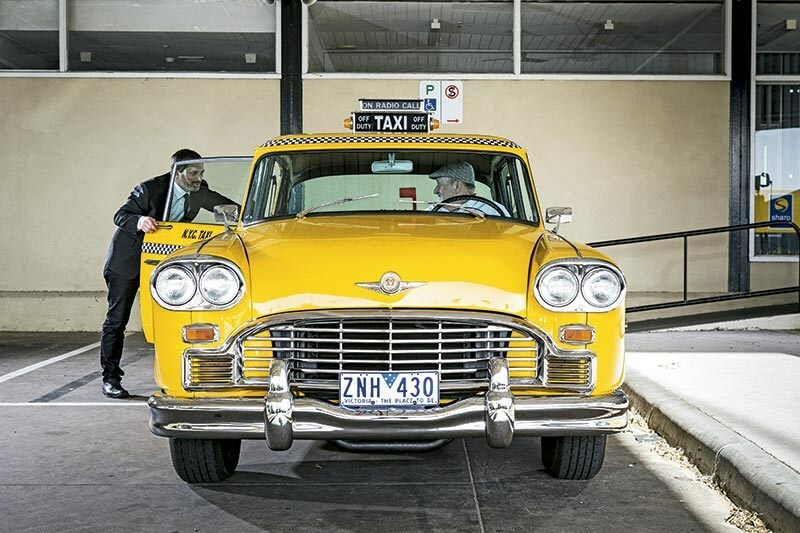 While they’re getting ever rarer in their home country, a tiny slice of the Big Apple lives on here in Australia, thanks to John Bell. He has five now. 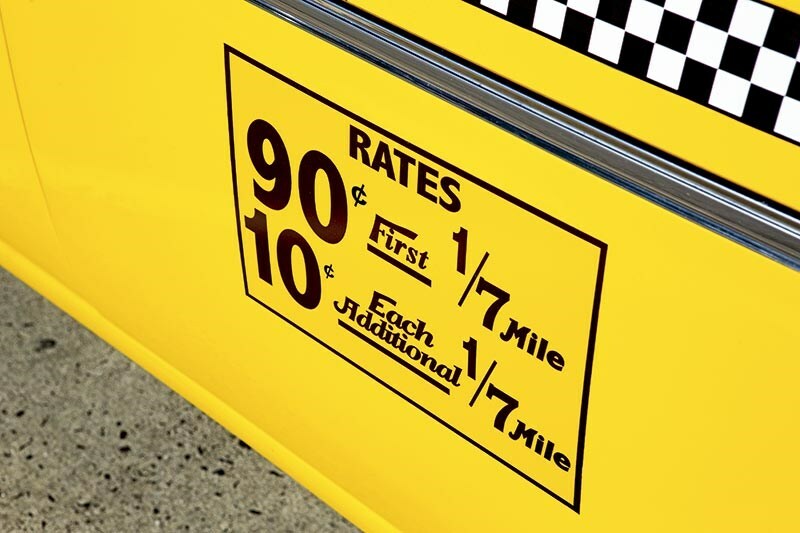 All restored to authentic NYC specification, from the trademark livery of black and white checkers on bright rich yellow paint, to the font and prices on the fare rate door decals. 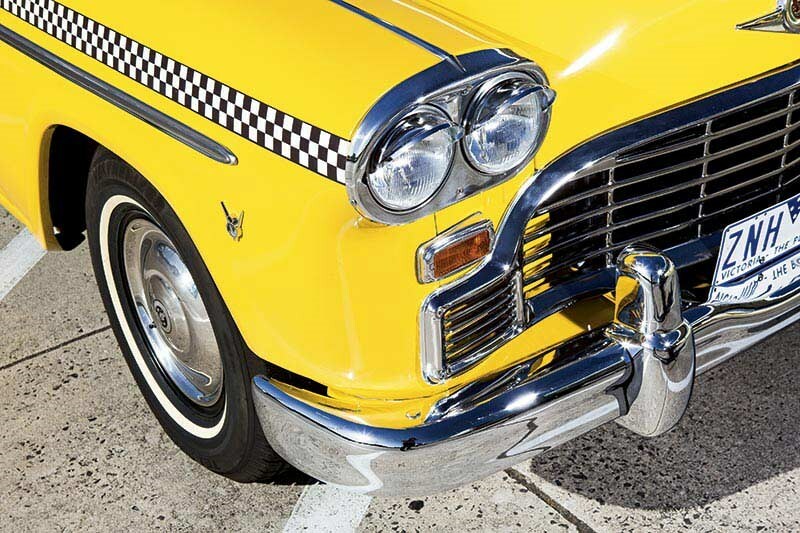 They’re in such a pristine condition that the Checker Car Club of America (CCCoA) has made John an honorary member and he’s known for owning some of the finest examples of these now scarce vehicles, once something so commonplace they blended into the NYC cityscape. 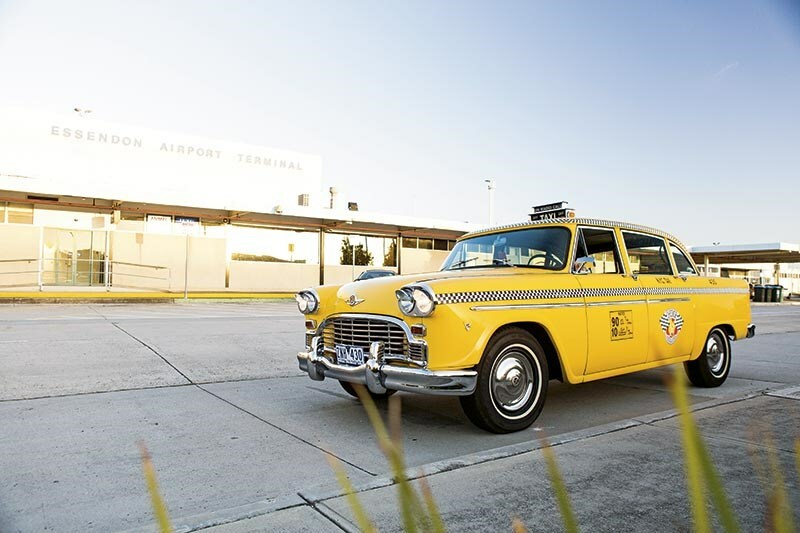 For 80 years Checker Motor Company made its own custom-built taxis out of Kalamazoo, Michigan, the A12 enjoying a twenty-four year production run from 1958 to 1982. The competition from Ford and General Motors to be the only cab on the rank squeezed the air out of CMC. The last A12 Marathon, painted up in green and yellow livery for use in Chicago, now resides in a museum. But the legacy lives on through enthusiasts like John. "I always remembered these Checkers from seeing the film Taxi Driver as a young guy. Now here I am, and it’s hard not to get enthusiastic about them." Although John admits it’s a bit more than an enthusiasm. "It’s probably got a little out of hand," John laughs. 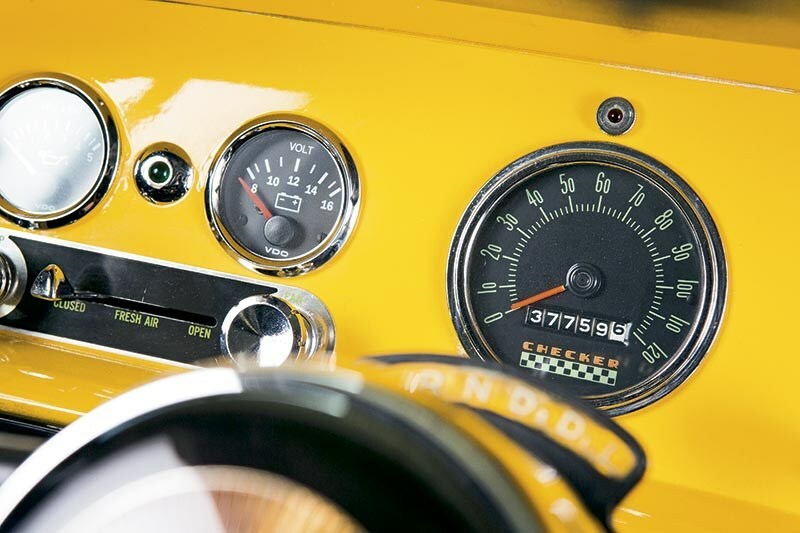 "I get calls and emails from people saying they’ve seen a Checker bar runner or Checker parts on eBay or a whole car has surfaced online. I’m often being told off for sitting at the computer late at night Googling for Checkers, feeding the habit. I guess you could say my enthusiasm has become infectious to others too." John’s not wrong. The more you look at his Checkers, the more you can’t help but love them. Their sheer girth and signature yellow paint work make them a caricature of themselves. It’s like suddenly getting a bit star-struck – you feel like a kid, wondrous and wowed. "I think that’s my favourite part about these cars," John says, "the enormous smiles on peoples’ faces when they see the Checkers just makes it all worthwhile. They’re big, happy, simple cars. People are forever taking photos of them, pointing." One of the highlights of our time with John’s fleet of rentable Checker cabs is sitting at the lights looking down on today’s taxi drivers as they scramble to take a photo before the green. They grin like they’re ten years old and bystanders are lit up by the vastness of the Marathon’s bonnet, it’s tall roofline and elongated, yet somehow sleek trunk, sorry, boot. Yet despite its presence, John glides the Checker through Chinatown as its endless string of lanterns glint off the body in celebration of the Chinese New Year. At one intersection a man gawps, forgetting about the U-turn he’s attempting. 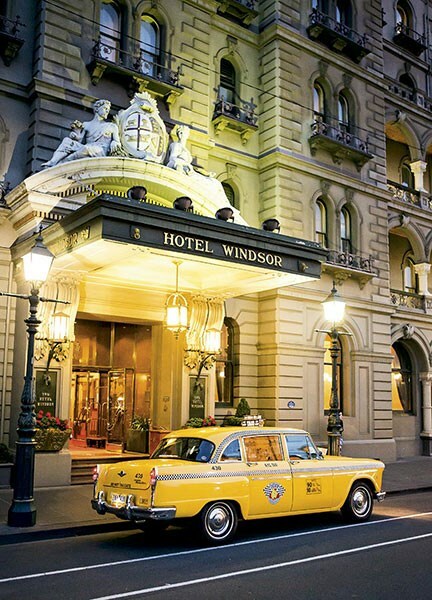 Pulling up outside The Hotel Windsor, its glorious Charles Webb design pre-dating The Plaza and The Waldorf Astoria hotels in New York, the concierge points in awe. His night has been made as he tells his colleagues to check it out. The Marathon’s 283ci Chev V8, makes only a burble idling under the glow of foyer lights. In fact the smaller plastic taxis in front and behind make more commotion than John’s big yellow one. With its completely flat floor, another piece of design brilliance, entry and exit from the vast cabin is effortless, agile. Moving briskly on, John can pull out into traffic with ease despite sitting on the left side of the car. "It’s so easy to see out of these cars, and other drivers can definitely see it coming so they stay out of the way. It’s easy to park too because the body doesn’t extend past the corners of the car. It’s also high enough off the ground I know I’m not going to hit any kerbs." One wouldn’t normally associate the word manoeuvring with a big American car with a three-metre wheelbase and a kerb weight nearing two tonnes. But considering the everyday function of these cars, John’s confidence is comforting as a passenger. 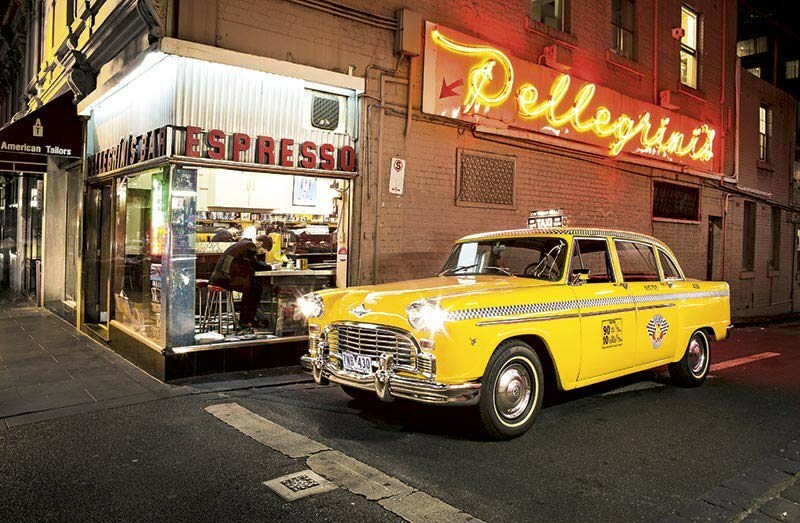 When you need to find an authentic late-night Italian coffee and pasta destination in Manhattan’s Little Italy, along Mulberry Street, Checker’s Marathon would take you there, slipping into the adjacent laneway. While John’s destination was not Manhattan, it certainly evoked all the emotions, the nostalgia of a golden time in this American icon’s life. You imagine what stories the Checker Marathon could tell if it could talk. John describes his Checker fleet as something to be proud of as we sit and chat in his workshop. He’s had a team of talented friends help give his cars the restoration they’ve driven millions of miles to earn. "For everyone who’s gotten involved with these cars, my wife included, their enthusiasm builds and builds. You just can’t help yourself but to love them." John’s fleet have delivered him some memorable returns on his investments, too. "The 1981 car took me to Nashville, Tennessee, where I met the sole owner John Singleton, who also owns Sun Records where Elvis and Johnny Cash made their music. In the glove compartment he left CDs of all sorts of Sun Records musicians and had looked after his Checker in the same way." "I’ve also been to San Diego," John says, "where I met another sole owner of an ’81 Checker, except it had a 5.7-litre Oldsmobile diesel engine in it. I bought it, gave it the works and it looks great now." It’s been a quick turnaround for John and his fleet. 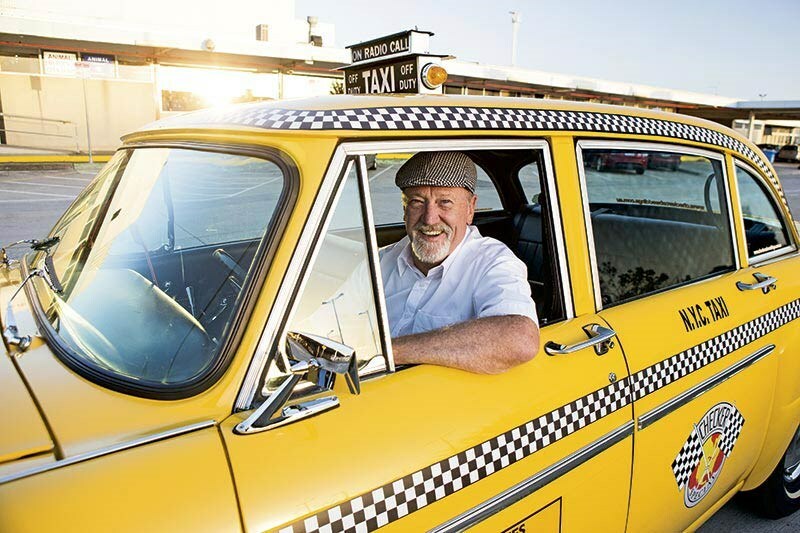 It was only a few years ago he sporadically decided to look into Checker cabs after a conversation while driving with a friend. "It just popped into our heads, ‘What about those Checker taxis? You never see them anymore.’ And that was it. 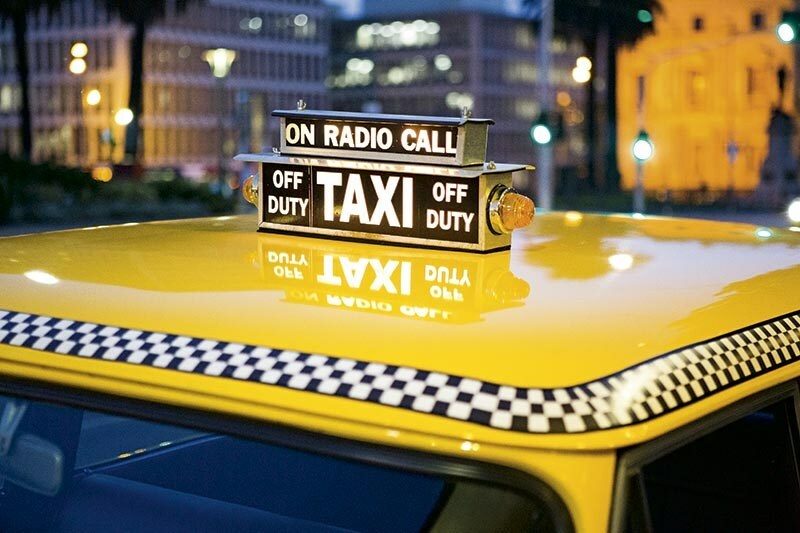 I got curious and soon enough bought my first cab." But John’s not quite finished. He’s on the trail of an A12 Aerobus, which is a limousine-style Checker and also very rare. "I think the Aerobus will just finish the fleet nicely," he says. Rallying his cars together for this story, it’s the first time all his Checkers have sat together. It’s a special moment. Sipping a hot bitter mocha between mouthfuls of simple deliciously authentic marinara from Pellegrini’s Espresso Bar, looking at this once proud and humble mode of mass transport you can hear its voice, its accent even. It has soul, this Checker. 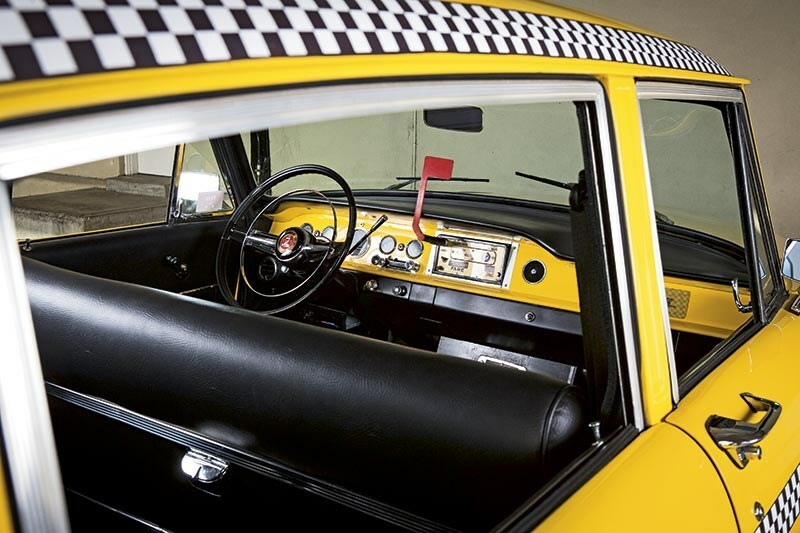 It’s not ‘just a taxi.’ These Checkers are a bold reminder of how the motoring world once was – believing in its product and built with passion. John’s Checker represents everything that is New York – stories layered upon stories – and holds a unique place in motoring history. For that we salute its star-spangled spirit, still asking anyone with a place to go and the means to pay, "Where to, pal? 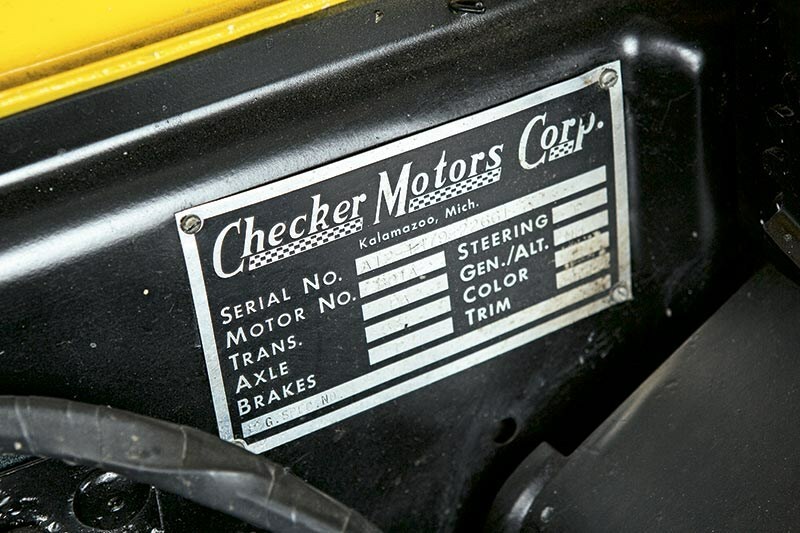 Checker Motor Company was a company with a profitable niche and it was only a matter of time before it was subjected to a shakedown from the big players. It signed a contract with General Motors in 1979 to build bodies and frame parts. It was a deal with the devil, Checker, helping supply the very company that was hell-bent on strangling it. 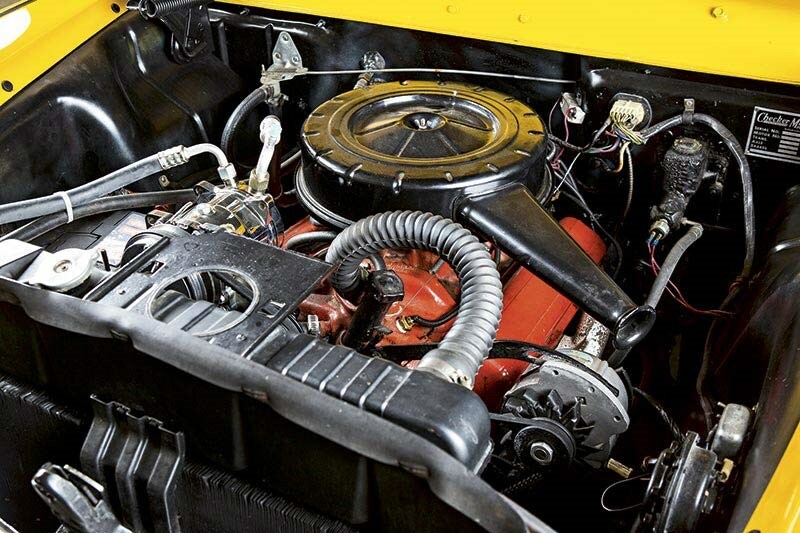 The US government introduced stringent fuel economy, pollution and crash testing legislation in the late ’70s and early ’80s which wounded CMC even further. 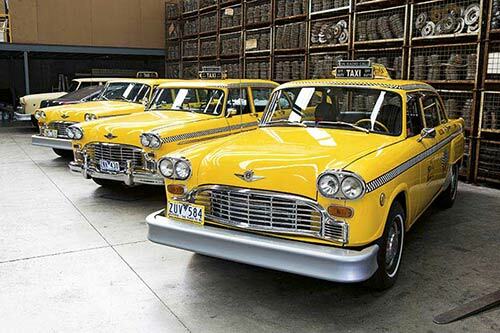 After a three-decade affinity with the taxi industry, when Marathons were available in over 90 colours including 200 two-tone combinations (Chicago alone had six different red/white schemes available), the end was nigh. Despite the forlorn future, Checker was still producing 200 cars per day in 1982, the year the factory closed. As bodies rolled off the line, many without crucial parts due to the slow turnover, they were left to sit in lots while the factory caught up. 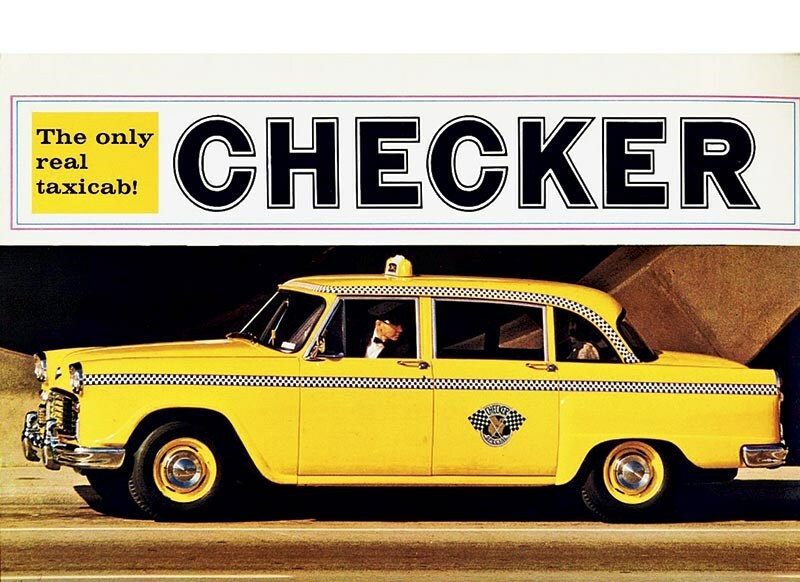 There aren’t many cars like the Checker Marathon in the world which were once so populous and are now so scarce. 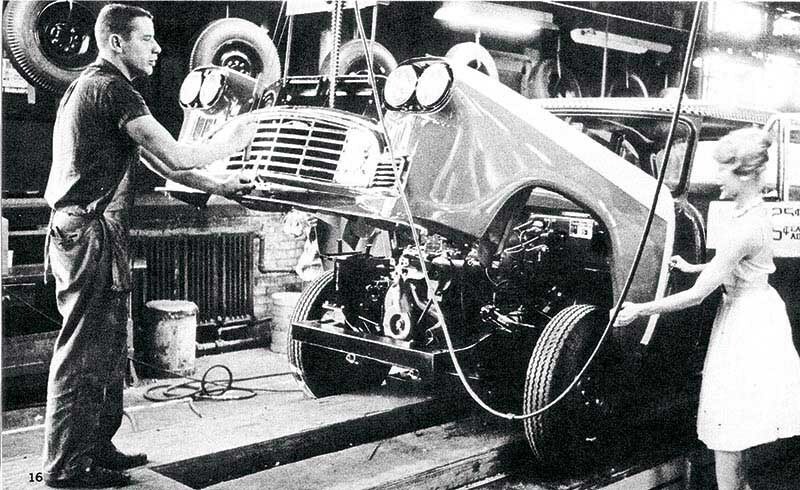 Experts in the States believe that over 100,000 A11 and A12 Marathons were built between 1958 and 1982 but only 300 – that’s 0.3 per cent – remain in roadworthy condition.